Well if last week’s trip to S. Sullivan’s was a trip down memory lane to the 1990’s a trip to 1-Republik is a reminder that we are in 2011. Located on Washington Street between 2nd Street and 3rd Street, one of Hoboken’s newest bars clearly has established itself in the bar centric city. Taking over the failed Mile Square spot, the owners of Tonic in Manhattan performed a gut rehab and opened this bar with the notion that everyone must be obsessed with TVs. I went to 1-Republik on a Saturday night during the NFL playoffs and it was impossible not to notice the sheer volume of Televisions in this bar. It was like a shrine to St. Panasonic. The bar was packed when I got there at around 7:15 which I thought was a little surprising since it’s a little early for the evening crowd and the teams playing really don’t have strong fan bases in Hoboken. However, if you build a place with 50+ TV’s people will flock to the bright HD light like moths to a flashlight. That said, I am a big fan of the layout of the bar. At the center of the place is a large, rectangular floating bar with bartenders serving drinkers in every direction. The sheer size of the bar and layout allowed for the standing patrons (like myself) to spread out evenly behind those lucky enough to get seats standing- only 1 or 2 people deep. From there we had to scream our orders and reach over those seated in front of us to grab beers. Lining the inside of the restaurant is a ring of tables and booths, but obviously not enough to satisfy the crowd as there was still an hour and a half wait for seating. It seems that a lot of people would order dinner and want to have a few drinks afterwards and kept the table occupied so the wait list took forever to turn over. Now I know I mentioned it earlier, but this place has tons and tons and tons of TV’s. If you want to bring a date that you don’t really want to pay attention to…this is the place. Every seat has a view of at least 3-4 TV’s so while your date talks about their troubles with co-workers or why one of their loser friends can’t get a date and other stuff you don’t care about you can still be kept abreast of what’s going on in sports. However, that brings me up to one of my main complaints about this place- if you have 50+ TVs, why do they have to all be tuned to the same channel? Every single TV…same channel. I know there was an NFL playoff game on, but that night there was other NHL and NBA games on. Why do I need 6 TVs all within 5 feet of each other showing the same thing? Toss a random Rangers game on one TV, a Nets game on another TV, maybe even Celtics game on somewhere. At least it gives me something to watch during commercials. The lesser games don’t have to be many TVs, just one in a corner somewhere. What the bar lacked in quantity of sports programming they made up for in the quantity of beers available. They have too many beers on tap to name, but I know I had an Anchor Steam, a Paulaner, and numerous very tasty Golden Monkey draughts from Victory Brewing Company. I have to highly recommend the Golden Monkey as a drinker who doesn’t love dark beers. It’s difficult to find something as alcoholic as Golden Monkey (9.5%) that still tastes light. As the night wore on, the bar started taking away some of the bar stools, a line began to build outside, and I got a sense the night was changing. 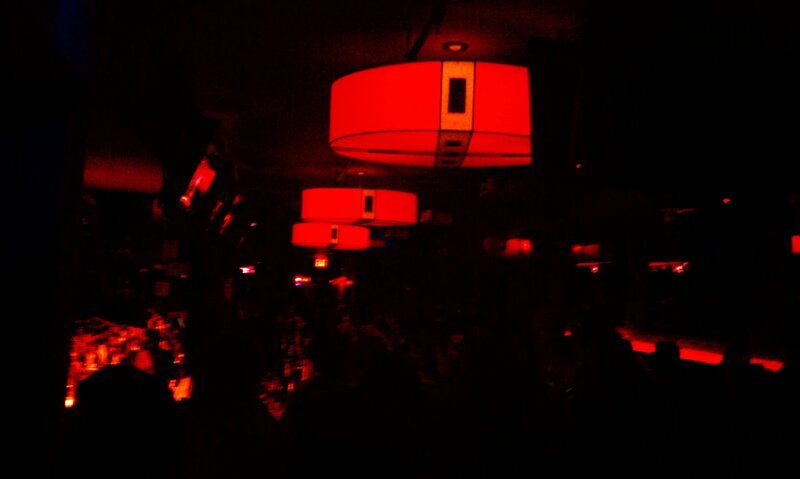 (I’ll write more about my befuddlement of lines at Hoboken bars in future posts). When the second the football game ended, all of the projection screens along the walls were pulled, the remaining flatscreen TVs turned to black, and the dance music that had been played just during TV commercials began to take over the place. The lights darkened with a touch of red and it was a sports bar no longer. With this bar’s metamorphosis complete, I, like a young butterfly, left the 1-Republik cocoon slightly disoriented and ready to discover more of the world. Preconceived notion – Thought it was going to be a slightly stuck-up crowded new bar. Bar Type – Sports bar by day, dance bar by night. Crowd stereotype – Early on there were tons and tons of guys. Most in large groups, but a few couples. By the end the women had descended on the place showing up in groups of 3-8. Crowd was in the 21-25 range and looked like a mix of Hobokenites and out-of-towners visiting Hobokenites. Music – During commercials they played some 90’s dance. After the TVs went up it was a full out dance party. Value – Average. No real specials when I was there. Date – Probably just an informal one. Too loud and distracting to really get to know someone. Catch up with a friend – A couple guys would be ok in a place like this because most need sports in the background to talk with anyone. Girls, not so much. First or last drink of the night – Little too crowded to just pop in. I like to be seated for my first or last one. Overall - Being owned by established and successful owners, you can tell 1-Republik had an organized and well planned direction. 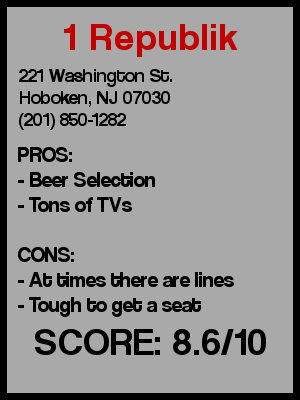 Overload the young 20 somethings in Hoboken with a ton of TV’s and a ton of beer choices. Both tend to bring a lot of guys around. And once you get the guys there, turn down the TV’s and the lights, and turn up the music and all of a sudden you’ve got a place that girls will feel comfortable and want to go. They clearly accomplished that. Normally I am not a fan of big, crowded bars, but this one is pretty good as long as you know what you are getting into. Service and selection is top notch here. But if you are going to be a quasi-sports bar…give me more than just one game on TV. On a scale of 1-10, I’ll go with an 8.6.